Refreshing Mountain Retreat and Adventure Center was founded in 1983 upon the vision of Marlin and Sharon Harnish to provide a place where families could be refreshed. What began with two bunk houses and a stable on the grounds of a run-down horse camp has now blossomed into a facility that hosts hundreds of groups and thousands of individuals on an annual basis. In the early 1980s, Marlin and Sharon became aware of a camp called Circle T Ranch, owned by the Lancaster Youth for Christ. The facility had not been utilized for a few years and had come into disrepair. At the time, Marlin was a property manager at a retirement community and Sharon was working as a part-time housekeeper and also in their home raising two young sons, Justin age 4 and Josiah age 2. They shared a desire to find a line of work where they could work together, raise a family, and minister to families. The “idea” of running a camp seemed to fit those parameters, though it seemed like quite a step of faith, especially since there was no business base to start with. They decided to take that step and moved here in December 1983. Initially, there was no functioning plumbing and Marlin says, “It was so overgrown, we were here a few weeks before we knew there was a pond on the property”. In December 1985, while preparing to welcome a “large group” of 50 people, the staff residence for the Harnish’s caught fire. Most of the belongings of the family were destroyed, as well as half of the structure. Though tough at the time, Marlin recounts that in the long run, this was a blessing for the family because insurance covered the re-building, which enabled some much-needed repairs. The Harnish family moved into their renovated home in April 1986, and Josh Harnish was born in May 1986. This year brought the addition of 20 Campsites and Tentsites for the facility. Brush was also cleared to provide space for a small playground and softball field. Suzanne Harnish was welcomed to the family. Fencing was added to the Outdoor Basketball Court. A new Deck was added to the north side of the pool. Hannah Harnish was welcomed to the family. A new fence and concrete deck were installed around the pool. Meeting Room A was added to the Dining Hall. Additions were made to Bunks 1-4, adding a larger bathroom area and more beds. A 6 unit “Log Lodge” was built at the top of the camp. Jeremy Harnish was welcomed to the family. Permanent Campsites were added beyond Gym #1. The kitchen was remodeled and an extension to the Dining Hall was constructed to provide more seating. Steps were added to the shallow end of the pool, and a pavilion was added in the Fall. More space was needed in the Harnish residence so a second addition was added to that house. Gym #1 was expanded to add bleachers and storage space, and Meeting Room C was added. Meeting Room B was remodeled. Of special note, this year began the construction of activity facilities, which have grown significantly since then. The Low Ropes Course was started, and a Climbing Wall was added in Gym #1. Mary Harnish was welcomed to the family. The largest construction project (up until that point) was started. This project converted a “summer only” facility and an apartment building into Bunks 5-6, a new office, 4 Private Rooms, and a small snack bar. Also, the High Ropes Course was started. This first course had 1 zip line and 4 other elements. The project with Bunks 5-6 was completed. A new surface and lights were added to the Outdoor Court. Don Bomberger was hired “full time” as Activities Director for the camp. Justin Harnish, graduated from High School and decided to work at the camp “wherever he fit in”. Bethany Harnish was welcomed to the family. An archery range was started. The horse barn and shed were removed to make room for the new Gym #2 facility. A craft cabin was built by the pond. A second staff house was added to the property. Gym #2 was completed along with a maintenance area to the side. This facility provided a meeting space for groups of up to 400 persons. The horse corral was leveled for a soccer field. A new Dining Hall Deck was added. The Low Ropes Course was expanded. A second Zip Line was added to the High Ropes Course. A new deck and water slides were added to the pool. And lastly, a 3rd addition was added to the original staff house. The playground was expanded. The office area was remodeled. A climbing tower was added. The softball field was lengthened. The west parking lot was expanded and paved. Construction on a new community pool was started in the Fall. The new pool complex was completed. This included a new Store/Game Room, a wet playground, and expanded diving well. New elements were added to the High Ropes Course, and existing elements were changed to use telephone poles (had previously been built into the trees). The Archery range was expanded. In the Fall, construction on a new Lodge (hotel style) facility was started. The New Lodge project (phase 1) was completed in the Spring. This added 12 new hotel style facilities and Meeting Room E. As part of this project, the parking lot below this facility was expanded. 10 new Low Ropes Course elements were added. The campsites/tent sites were renovated, improving the electrical supply and access to the sites. A skate park and portable climbing tower were purchased for the facilities. Bunks 1-4 were repainted and the bunk beds were rebuilt. 2 golf carts were purchased to rent to guest groups. An addition was added to Staff House #2. In the Fall, the old “Log Lodge” was removed to begin construction on the new Lodge project (phase #2). Toward the end of the year, Josiah Harnish, who had worked a few different places up to this time, decided to join the staff full time as a Maintenance Director. The new Lodge project (phase #2) was completed. This added 15 more Lodge rooms (hotel style) to the facility, taking the total number of hotel style rooms to 31. A horse barn was added. Retaining walls were added by the pavilion and pool. Path lights were installed to the Lodges. The low ropes course was mulched and expanded. Ken Hedrick joined the camp as our Food Service Director. His employment replaced Sharon Harnish, who, up that time, had been in charge of all foodservice at RMC. Sharon had also been in charge of cleaning, so this change finally allowed her the opportunity to “rest” a bit. She was also transitioning into a new role at that time: “Grandma”. Landscaping was added to the new Lodge facilities. Sand volleyball was added. The skatepark was sold (there was not enough use of it by guest groups). Mini-zip for children was added to the High Ropes Course. Renovations to the sewer plant were begun in the Fall. Our 25th Anniversary. We celebrated the year by giving a full camp scholarship to every 25th attendee of each overnight event. In September, a day of thanksgiving was held and access to the pool, Zip Lines, and Climbing Tower was free. This year also saw some significant remodeling to the kitchen and new kitchen equipment added. A second floor was added to the deck by the pool. 2 additional golf carts were purchased for rental to guest groups. In the Fall, construction on a new meeting room and maintenance facility was begun. Construction on Himroasa Hall was completed. This facility seats up to 200 persons and adjoins the Gym #2 complex. Additionally, a new Maintenance Facility was completed. Camp Road, which runs through the camp facilities and was previously a township road, was vacated by the township and turned over to Refreshing Mountain. This enhanced the security of the camp in that it enabled us to better control who has access to the camp at what times. In the Fall, the porches in front of Bunks 1-4 were renovated, adding seating space and new landscaping. Our High Ropes Course was dismantled and reconstructed to include a Zip Line Canopy Tour, and 11 additional High Rope elements. The entrance to the camp was upgraded to include a stone wall entrance and flowering trees along Camp Road. Planning began for renovations to the Dining Hall to add seating and an enhanced meal atmosphere. Suzanne Harnish, who had been working part time as the camp store manager, transitioned to Full Time in the Office, as the Guest Services Coordinator. In September 2010, RMC completed construction of a 62.72kW solar energy system. There are 3 arrays of solar panels. The most obvious one is between Gym #2 and the soccer field (from the back, it looks like bleachers). The other two arrays are on rooftops. This project provides approx 30% of our annual electricity needs. It was funded, in part, by a grant from the Commonwealth Financing Authority. Over the winter months, the Dining Hall and Meeting Room A were combined to create an even better dining experience, adding accessibility elements and allowing for a total seating capacity of 350 people. The foyer next to the Dining Hall is also useful as a small meeting area, while the improved deck on the front of the Dining Hall allows groups to peacefully enjoy the new Koi pond and a wonderful view of the camp. From there we rearranged the entrance to the pool to allow swimmers to go directly into the pool area instead of going through the Camp Store to enter the pool. A greenhouse was placed down by the Maintenance Facility to aid in grounds improvements projects. 2011 also saw the addition of several key staff positions. Sunny Redcay joined the office as the Sales Coordinator, and Jeff Martin joined the activities staff as the Activities Director. Judy Bomberger, who had been working in Houskeeping for a few years, was promoted to the Housekeeping Manager. In the Spring of 2012, we added a Gaga Pit and Activities Pavilion, and we also began the process of adding cabins to our facilities. The first 3 cabins were completed in May 2012, with plans to add up to 13 over the next few years. In the Fall, we began construction on our second zipline canopy tour, the Aerial Excursion, which includes 7 ziplines, 3 sky bridges, and a 40 ft rappel at the end. In March 2013, we opened our new Zipline Canopy Tour, the Aerial Excursion. This brings our total zipline options on-site (combined between the Challenge Adventure Tour and the Aerial Excursion) to be 12 ziplines, at close to 1 mile of combined length, in addition to numerous sky bridges and High Element Challenges. We also completed a renovation to the front office, adding additional space to check in guests. We completed an addition of a kitchen and bedrooms to a staff house on the premises, and we also installed a new dishwashing system in our Dining Hall, which started a new “era” in foodservice for the camp. For many years, RMC had served meals on disposable plates and used disposable utensils. With the installation of the dishwasher system, we have been able to transition to a nicer serving experience for our guests. In the Fall of 2013, we began construction on Meeting Rooms J, K, L, and M, as well as 4 more cabins. Meeting Room K is very similar to HIMROSA Hall (approx. 200 people), but on the other side of camp, to provide a sizable meeting space for the cabin and bunk guests. J, L, and M are meeting rooms that seat 20-60 persons and make nice “breakout rooms” for K.
The Spring of 2014 saw the completion of Meeting Rooms J-M and 4 cabins (taking the total completed to 7). We also installed a number of swings, bushes, paving, and other landscaping improvements around the cabin and meeting room areas. For the summer season, we added the option to rent GoPro cameras on the zipline tours, and we also added a Geocaching activity to the list of options guests can do onsite. In the Fall of 2014, we began the final phase of the cabin project. 6 additional cabins and 2 small meeting rooms are being added, which will take the total number of cabins to 13, with 4 “basement meeting rooms”. 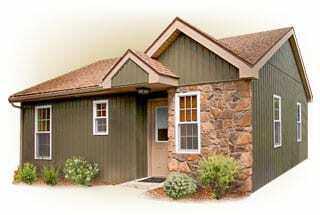 An addition was also added to a staff quarters for additional lodging. The Spring of 2015 saw the completion of our 13 cabins and Meeting Rooms K, L, and M.
In the Fall of 2015 we expanded our barn area to accommodate more farm animals and built a larger horse riding area. We also added a pedal cart track which includes an authentic Lancaster County bridge adding pedal carts to our activity offerings. Construction also began on our Activities Pavilion to include a large deck overlooking our newly built pedal cart track, fire pits, and the ropes course area. The addition included an expansion of our Activities Pavilion for an indoor store and check-in area. As Spring sprung and the flowers grew, so did we, acquiring 16 acres of adjoining woodland. Our Activities Pavilion expansion project was completed which opened up a beautiful new indoor store and large observation deck. We continued to grow in our activities department with new adventure packages and further development of our equestrian program to include private horse riding lessons. The end of 2016 brought three major changes. We added our 3rd zipline course- the Flying V. Offering 2 ziplines, this course was designed as a low cost option for a quick zip. In addition to the Flying V zip, we revamped our pool with a new lining, expanded the water play area and added a pavilion. We took out the deck in front of the office and fitted bathrooms below a brand new deck with open views of the pool area and pond. As the leaves and snow began to fall, so did our sledge hammers. Remodeling began on bunks 1-4. Demo crew included all full time staff from the kitchen to the office (those who don’t usually get out of the indoors to work). The team had a great time slugging away wall and chimneys. The year of blessing and thankfulness. Early 2017 found us completing Bunks 1-4 adding beautiful pine wood interior and vaulted ceilings. This project ended late January/early February. Late February (25th) we experienced straight line winds, later deemed a tornado. The damage felled 100’s of trees, which took out all three zipline courses, damaged the roof of Bunk 4, several cabins, power lines, and a staff house and numerous other structures around the property. Power was out, so the generators kicked in. Miraculously, there were no injuries to guests or staff, even though we had over 350 people onsite. The weeks following were a testimony to God’s faithfulness to us, even in difficult circumstances. Initially, we projected that the repairs would take 3-4 months to complete, which was a huge concern since it was going to cut into our busy summer season. But as the repair process got started, everything from the timing of contractors, availability of equipment and materials, and the cohesion of our team during this time, was providential. There were many stories of “extremely fortuitous circumstances” in the month that followed, which we could clearly see as God’s provision of restoration to those things that had been destroyed. All major repairs were completed 4 weeks to the day from the storm. The Flying V ziplines debuted that spring as planned and we had enough time to salvage the Spring and summer seasons of business. If you would like to hear more about this testimony of God’s Faithfulness (as well as see pictures of the damages), here is a link of a video that was put together about the experience. Click here. On Oct 8. the second youngest daughter to Marlin and Sharon, Mary, was married. In preparation for the celebration held here at RM, a new waterfall was built on the pond, a deck overlooking the pond was added, and a new habitat renewal project to revamp the pond finished it off. With the end of 2017 came more remodeling and building. We finished up the bunks and matched bunks 5-6 to bunks 1-4 with pine wood interiors, new bathrooms, and new bunk-bed designs. 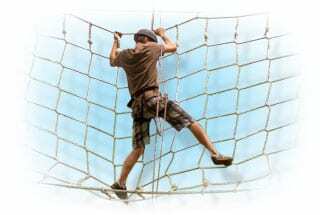 The Elevated Obstacle Course was added to the activities area offering a total of 22 high rope challenges ranging from 6-23 feet off the ground. 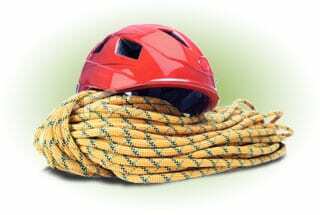 With 2 levels of 11 elements each, it doubles our high rope challenge offerings. Plans are in the works to extend the dining hall. We plan to add more seating as well as enhance the flow of traffic through the food lines, allowing for shorter wait times and a more “refreshing” dining experience. There may also be some lounge space/meeting space added to this building. Time will tell what the final design looks like. We hope to break ground on this project sometime toward the end of 2018. The story of the success of Refreshing Mountain is a testimony to the Lord’s faithfulness to “bless the works of our hands”. The initial vision of Marlin and Sharon, accompanied by their hard work and consistency, led to the development of a camp and retreat and adventure center, as it is today. That vision has grown beyond them and is joined by other employees who share that vision and expand on it in their own ways. Marlin says that he would never have been able to grasp the concept of Refreshing Mountain today when he first started, but he just took one step at a time, and this is where it has led thus far.